This isn’t about a perceived lack of meaning due to abandonment of a particular set of theological doctrines. This is about the erosion occurring to a frequently used noun; terrorism. The meaning is commonly accepted to be any kind of violent terror that is inflicted in order to coerce a particular action. Most of the times the intended outcome involves the release of their comrades from imprisonment. The recent ones have been about religious extremism. There have been terror attacks by anarchists with the purpose of chaos, which they ideally believe to give chance for an alternate governance or non-governance that might lead to widespread societal harmony. A vast number of times, attacks have been inflicted by the lower rung to the burgeoise. The Nihilist Movement worked this way predominantly. The ETA and IRA organised terror attacks for their causes as well. But 2011 bore witness to an act that resonated with the global conscience. Religious extremism was able to inflict the deepest blow to modern civilization. Organisations with a military outfit used to prepare their plan with a target at hand, but as of this point in time, maximum indiscriminate fatalities are the norm. The arbitrary nature of this provocation can be deciphered from midnight attack at Mumbai and the Nairobi Westgate Shopping Centre tragedy. 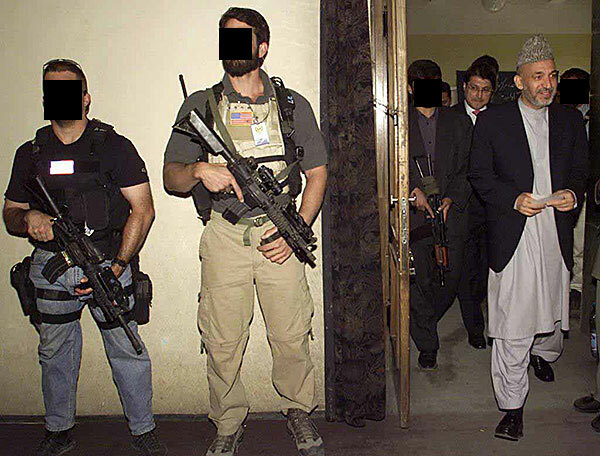 SEAL Team Six provides close protection for Afghan President Hamid Karzai. Historically, leaders began to be fitted with protectors after the first terror outfits started gunning for them. Is this the outcome that can be generated by present day terrorism? Security State with pervasive state protection for civilians. Of course there will be criteria to be eligible for maximum protection which can only be afforded by the upper rung. What will the indiscriminate terrorists do after finding it cumbersome to get at the burgeoise while a large section of the population are just fish swimming in a barrel. Geographically, an urban area with access represents this barrel, which would mean a wide range of barrels for picking. The Al-Qaeda core has weakened but its affiliates are going strong. These extremists have effectively hijacked terrorism to spread their fundamentalist ideology. The replacement of Christian Law with Sharia Law. Terrorists used to be minimally funded and their targets were local but now we have entered a phase where globalized terror has embedded itself in the worldwide psyche. The funds have improved as well. The meaning of terrorism is declining, all the while engorging itself into a monster with life of its own.